One of my fears in being pregnant for the first time is developing the dreaded stretch marks. Pregnancy stretches our belly's skin to its limit in order to accommodate the growing baby; so yes, there are huge chances of getting stretch marks on mothers. Stretch marks are super ugly (because they give the impressions that a tiger just scratched on your belly!) and may take a long time to fade; hence the last pregnancy gift I want is having them in the slightest. Some people say that genetic factors also play a role in developing stretch marks. The other day, I asked my mother if she had to deal with any of depressed purple or reddish streaks in her abdomen's skin when she was pregnant with me and my siblings - she said she never had any problem with stretch marks before. I was so relieved to hear that. Also, I am not certain if some women just don't get their stretch marks because of the fact that it's their first time of being pregnant (and they are not carrying twins) so their skin is still pretty elastic. My 36 weeks pregnant belly. So far there are no stretch marks. My worries of stretch marks had made me extra cautious in preventing the formations of stretch marks in my pregnant belly since the very beginning of my pregnancy. Thus far, I am happy to notice that I have sailed about 36 weeks of gestation period with a smooth belly skin and *knock on wood* I hope they don't appear after I publish this post. Anyway, here is a run-down of methods I do in preventing the appearance of stretch marks on my belly. I don't know if these methods work for other pregnant women out there as everyone is different but the following are my best tries in avoiding or minimizing the appearance of stretch marks. When I first learned that I was pregnant, my friend advised me to start investing on good quality stretch mark lotion as early as possible to prepare my belly skin's elasticity and suppleness. There is no need to wait for my pregnant belly to expand before applying any stretch mark lotion. This said, long before I had a protruding tummy, at 8 weeks of my pregnancy, I bought my first bottle of stretch mark lotion and started applying it twice a day on my belly. My favourite and trusted brand so far is Palmer's Cocoa Butter Formula Massage Lotion for Stretch Marks. The lotion is non-greasy and contains Cocoa Butter, Vitamin E, Shea Butter and Collagen, among other things. I have tried using Pureen's Stretch Mark Lotion once but I was not so fantastically pleased with the product so after one bottle, I quit buying it. I've used three bottles of stretch mark lotion so far. And I am about to open my fourth one soon (above). In my opinion, the drawback of Cocoa and Shea Butter based stretch mark lotion is its horrible smell. I honestly can't stand it. Therefore, these days, I apply both stretch mark lotion and baby lotion on my belly minimum twice a day. I apply a little bit of baby lotion too in my belly to alleviate the strong scent of Cocoa and Shea Butter. Another friend of mine (who was pregnant and did not have any stretch mark at all during her pregnancy) recommended Bio-Oil to prevent stretch marks and she said this oil may have much lighter scent as compared to other stretch mark lotion brands. However, I have not personally tested this product as my husband advised me to just stick on the stretch mark lotion brand that has worked wonder on me to date. Further, at the time when my tummy started expanding rapidly, say at the 6th or 7th month of my pregnancy, I had the chance to use Body Shop's Shea Butter Bath and Shower Cream once a day to extra moisturise my belly skin. The shower cream smells like Play-Doh but I forced myself to keep using it for the sake of its substantial moisturising properties. You know as our pregnant belly expands sometimes it gets very itchy. I hold the urge of scratching my belly's skin every time it gets very itchy because I heard scratching the skin will promote the appearance of stretch marks. When itchiness pays me a visit, I quickly apply my stretch mark or baby lotion on the itchy area to prevent me from scratching. but ended up using this lotion for myself for the time being. Drinking water is no rocket science for maintaining a healthy pregnancy. Water is good for our pregnant body, digestion, baby and skin. I drink at least 2L of water a day to keep (myself and) my skin hydrated, healthy and *fingers-crossed* stretch-mark free. Some articles say if we gain weight to rapidly or too much during pregnancy, the weight gain will stretch our skin too severely; hence stimulate the appearance of stretch marks here and there. I maintain my pregnancy weight and my baby's weight gains at steady pace by remembering not to go crazy on my eating habit. I know I am eating for two now but I am fully conscious that I am currently feeding one adult (me!) and a baby. Not two adults. I just stop eating when I am full. Exercise is said to be one of the effective ways in minimizing stretch marks. I don't do any specific regular physical exercises during my pregnancy but sometimes I do swim, take a walk in the park or shopping malls, complete my part of daily household chores, climb a flight of steps many times a day (because my bedroom is upstairs) and sweat in the kitchen when baking cookies or cakes. Not sure if these activities are actually reckoned as pregnancy exercises to help me stay away from stretch marks, though. By investing on all the above, I really wish that I will not have to spot any stretch marks on my belly and other body parts during this pregnancy and postnatal later on. The parents-in-law are overseas this week, so my husband and I sort of got the house for ourselves for the whole week and I am enjoying it (Haha!). While his Mother is away, my husband tasks me to practice cooking at least once a day, either for lunch or dinner. Yesterday evening, I experimented making Indonesian style steamed rice topped with chicken and mushroom (Nasi Tim Ayam Jamur) for the first time. Different from Singapore or Malaysia's Chicken Rice, this dish was indeed something new for my Malaysian husband and I myself hardly eat this food back home. The preparation for this dish took me more than an hour but I guess the results were worth the efforts, especially since my husband said the rice tasted quite nice. Please note that the ingredients stated below are just my rough estimates. I didn't really measure the exact ingredients I used for the cooking as long as I achieved the balance of everything. My style of Nasi Tim Ayam Jamur. 1. For the topping: Sautee some of the minced garlic and all of the minced sweet onions until fragrant. Add the cubed chicken breast and sliced mushrooms. Add sweet soy sauce, thin soy sauce, fish sauce, oyster sauce, a dash of sugar and pepper. Put the hard-boiled egg into the mix and add half a cup of chicken stock. Cook the topping until there's a little bit of water left. Don't forget to taste it. Set aside. 2. For the rice: Sautee some of the minced garlic with the rinsed rice. Pour the chicken stock into the rice mixture. Stir evenly and cook the rice until there's almost no more water left in the wok. Season the rice mix with enough thin soy sauce, fish sauce and a little bit of pepper so it won't taste so bland. 4. In small (metal/aluminium/ceramic) bowls, put some of the chicken, mushroom and sliced egg topping in the bottom of the bowls. Top the chicken mix with some of cooked rice. Steam them for about 20-25 minutes until the rice is totally tender. 5. To serve: Place or flip the bowl against a plate so the bowl's content will be printed upon the plate. Serve this dish warm with light chicken broth and chopped leeks, if desired. Instead of using chicken meat, we can also use beef or pork for this dish. I made about three small bowls of this halal steamed rice yesterday evening. As mentioned, this dish is best served warm so always heat it before eating the dish. I can't believe that I have been growing and carrying a baby in my tummy for a little over than 8 months by now. 36 weeks pregnant and already gained 13.5kg. Thank God, I don't look that bloated. At present, it's not easy for me to move around and honestly, sometimes I do miss my pre-pregnancy body. These days, I walk so much slower than usual, almost at my 95 years old Grandma's walking pace (err.. okay, not really, I still can walk a little faster than her!). Also, I suffer from sciatica. The shooting pains from sciatica on my right buttock area goes down all the way to the backs of my right thigh since my second trisemester and I still feel the same, if not, increasing pains until this very moment. Because of the excruciating pains on these areas, on some bad days, I have to walk with a limp, need to rest or stop for a while midway up when taking a flight of steps, cannot put on my own pants without sitting down, find it so difficult and painful to change my position when I sleep or get up after I sit down. Anyhow, I have endured these pains for almost four months already, with no medication but analgesic balm rubs on my thigh at night, and should be able to work things out in facing these dull muscle aches for another month or so until my baby's birth day. And oh, I think my baby presses my bladder so hard that makes me go for a wee, literally, all the time. Can't wait to see you, baby! I am hanging there. I am almost there. Before I start with my pregnancy updates, let me share with you two big things that happened in my daily life this week. The first one is that my husband and I had finally received our very own new house's keys from the developer on Thursday! That means, my husband and I can start renovating the house any time we are ready and hopefully, the three of us could move to the new house very soon. The second one is the birth of my best friend's first baby yesterday morning. Astrid and her husband welcomed their little bundle of joy, Baby Darlene, exactly on the day when Indonesia celebrated her 67th Independence Day. Merdeka!!! I could not be happier for the new parents. Congratulations and welcome to the parenting world, BFF! Now, let's move on with some updates on my latest antenatal visit I had this morning. There's not much updates I can share at the moment because my husband and I pretty much had brief consultation and baby's ultrasound scan with the Gynae today. My major pregnancy complaints this week were the facts that I had been really constipated, nauseated and vomited twice in the past two weeks (perhaps due to the iron supplements that I have been taking in the past couple of weeks). My Gynae suggested me to drink milk products to ease my constipation as I tend to have diarrhoea after consuming milk and stop taking the fibre solutions because they gives me indigestion issues. I am not sure if I want to try this because I am aware of the agony in my stomach after drinking milk. Despite its horrible taste, I don't mind taking Prune Juice as natural constipation reliever, though. Next, my Gynae did her routine 2D ultrasound scan on my baby. Everything looks normal and I have enough amniotic fluid as of now but my Gynae had difficulties in snapping good picture of my baby's face via the 3D ultrasound scan because my baby's face is now too close to my uterus's skin. My uterus is kind of cramped with the growing baby. The only thing that we could see very clearly via the ultrasound scan today was my baby's gender - which we all have already known. My baby girl's face at 35 weeks and 3 days: Still growing. My baby's weight gained a little bit in these two weeks because I myself didn't gain so much weight either recently. In total, I gained 13.5kg by now. My Gynae said my baby's current estimated weight is still within the normal range considering that I have a 'slim' pregnant build. Therefore it is best if my baby's size is not too big, else I'd have problems in delivering her. Nevertheless, my Gynae mentioned that I should not worry much about the baby's weight as she'll definitely pile more fats up, thus get heavier, in the last couple of weeks of my pregnancy. Meanwhile, I am still required to monitor my baby movements on daily basis as usual until my next Gynae visit in two weeks' time. 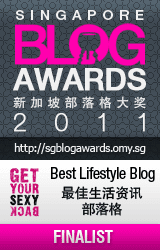 Last but not least, with this opportunity, I'd like to wish all my Muslim blog readers, Selamat Hari Raya! I just had gone through one of those epic queues in the hospital where I had to queue for almost 4 hours this morning in order to have my 10 minutes monthly consultation with my Gynae. Everything about today's Gynae visit seemed go wrong since morning, i.e. (1) My husband could not send me to the hospital because he was too sick to leave his bed. I hated it when he could not make it to the antenatal visits with me to check on our baby's development together. But what to do? When the man is sick, he is sick. I had to see my Gynae alone. (2) When I arrived to the hospital, I accidentally dropped my water bottle on the floor, the plastic bottle cap broke into pieces and I flooded the hospital's waiting room with my drinking water. Yes, everyone's eyes were on me. (3) The hospital registration counter somehow didn't register my name for the Gynae's check-up so my name didn't appear in today's patient list. Luckily, the Gynae's nurse got this problem fixed after my long explanation. (4) My Gynae had to deliver two babies this morning alone. This contributed to the super long waiting hour I guess. Moving on, once I have checked my name in to the nurse's station, I was directed to go the hospital's laboratory to do the Full Blood Count (FCB) test as scheduled. The laboratory guy drew blood from my left arm in less than 5 minutes and asked me to go back queueing to see my Gynae. My husband who felt slightly better at noon got up from his bed and drove to the hospital to see a general physician for his throat infection and then, join me to see my Gynae. Say, about 4 hours later since I first registered my name in the hospital this morning, the nurse finally called my name and we got to see my Gynae. The first thing my Gynae discussed when she saw us was the results of my FBC test. It looks like my haemoglobin (HB) is kind of below the normal rate which exposes me risks such as difficulties in pushing during labour as I'd be running out of energy pretty quickly and excessive bleeding post delivery. To correct this, she prescribed me with supplements for iron deficiency for a month to increase my HB at least by 1. I have to stop taking my pregnancy multivitamins for the time being. Next, I told my Gynae how I felt in the past month. I told her that my baby's hiccups few times in a day are actually quite annoying for me to feel but she said hiccups are signs of a healthy baby. Also, I mentioned that in this third trisemester, my pregnancy has given me serious mood swings (again), constipation and occasional menstrual-like cramps which are actually Braxton Hicks contractions. She said Braxton Hicks contractions at this stage are normal and gave me fibre solution to ease my constipation. After the brief consultation, the moment that my husband and I waited for arrived. We saw our baby again via the ultrasound scan. My Gynae did a top to bottom 2D ultrasound checks on my baby; measuring her head circumference, checking her eyes, nose, hands, heart, abdomen, legs and genital area. Based on her ultrasound scans today, my baby's head has partially dropped into my pelvis. It's earlier than I thought but my Gynae assured me that there is nothing to worry about it. First babies generally descend into their mothers' pelvis faster. My baby was sleeping when we checked her with the ultrasound scan. My Gynae had difficulties in getting good angles to show us her face via the 3D ultrasound scan as my baby was sleeping and using my placenta as her pillow. That means her face was partially covered with my placenta. 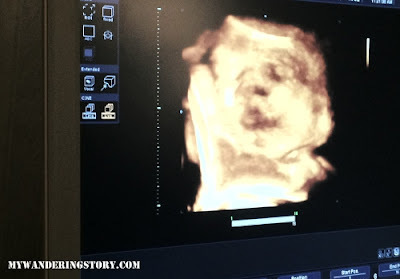 In addition, as the baby grows bigger in the uterus, seemingly it's harder for the Gynae or sonographer to get good view of the baby's face via the 3D ultrasound scan. Here are some of the baby's 3D shots that we managed to take home today. See how she uses my placenta as her pillow when she sleeps? My baby girl at 33 weeks and 3 days: She looks more like me now? Before we left the Gynae's office, my Gynae talked about the mood swings issues that I have experienced lately. She said mood swings are actually common happenings for pregnant women after they hit their 30th week gestation period and the emotional upheavals may continue until two weeks after the baby's delivery. My Gynae advised my husband to be extra patient with me because these days I might not be able to control my emotional roller-coaster very well. However, she emphasized that it is best if I could identify the triggers of my recent mood swings. For example, what makes me angry and sad? Is it because I didn't get enough attention from my husband? Is it because I didn't manage to eat some food that I wanted to eat? Or is it because I could not see some people that I want to meet, considering that I am pretty much a loner in Malaysia? Whilst I was scratching my head to give at least one excuse to my Gynae, my husband pointed out that perhaps I get the mood swings partially because I am anxious about the post-natal confinement that I would have to perform soon. My husband knows that I am against the strict traditional Chinese confinement practices but somehow the older generation family members would make me go through these painful practices after I give birth, no matter what. My Gynae told us that I should not worry about confinement too much and in fact, I should be able to enjoy it. I don't have to follow those ridiculous old-fashioned confinement practices that don't leave me with much benefit. For instance, if the elderly forces me to eat the same certain food for a period of time, then it's my husband's duty to feed me with other food when the elderly is asleep at night. I should keep on eating vegetables and fruit during confinement. I can and should bathe and wash my hair as often as I could for the sake of good hygiene. I can drink normal water too instead of drinking only red date tea for 30-40 days. Honestly, now I feel so much better and relieved after my Gynae gave me a green light to not stringently obey the traditional confinement rules. My next visit to my Gynae is exactly two weeks from now and I hope my overall health and mood would improve by then. As for my pregnancy weight, I have gained 13 kg in total by now. I only put on 1 kg extra in the past month and my Gynae said it is not much for a pregnant woman in her third tri-semester. Doctor bills: RM 133 (for the Gynae's consultation fee, urine and blood laboratory tests, fibre solutions and iron supplements capsules). Ever since I learned that there was going to be a Parenthood Expo held in Kuala Lumpur in end of July, I had been looking forward to check this expo out and shop tons of stuff for my baby like crazy. This Parenthood Expo claims itself to be Malaysia's largest branded mother and baby expo so needless to say, being a first-time Mom and attendee of such expo - I had high expectations in going home with lots of baby items bought at cheap(er) price. End of July finally arrived. My husband and I indeed went to Mid Valley Exhibition Centre, Kuala Lumpur on last Sunday with the hope to purchase bargain baby essentials; mainly because we have purposely refrained ourselves from buying certain baby items before this expo actually took place. Definitely not my best picture, taken in front of the Parenthood Expo last week. I looked so plump and tired. My God! The exhibition centre where the Parenthood Expo was held was just so full of expectant parents, parents and their kids. It was almost impossible for me to check most of branded baby clothes on sale because I was literally rubbing shoulders with other pregnant mothers, grand mothers and parents. 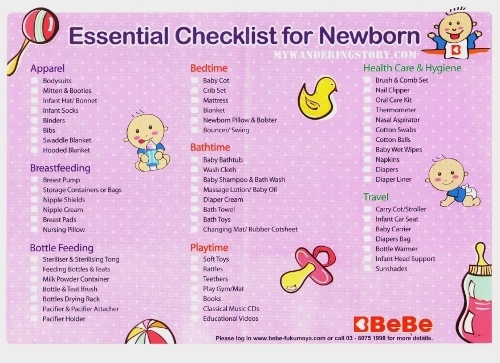 Anyway, since we're there already, my husband and I looked around and bought some of baby and breastfeeding essentials such as breast pump, nursing bras, breast pads, baby bath towel, cloth diapers, baby bottles' strainer, baby wipes and a little bit of baby apparels, to name a few. We didn't manage to buy baby stroller, baby walker and infant car seat from the expo as planned because their costs were so out of our budget, even after rebate. A snippet of the hourly lucky draw at the Parenthood Expo last week. When my husband waited for his name to be called during the hourly lucky draws at the expo (but it was not, sadly); I continued looking for baby clothes and shoes at some exhibitor stands that were not madly cramped with buyers and I was so happy to bring home these cute baby girl shoes from Bebe. 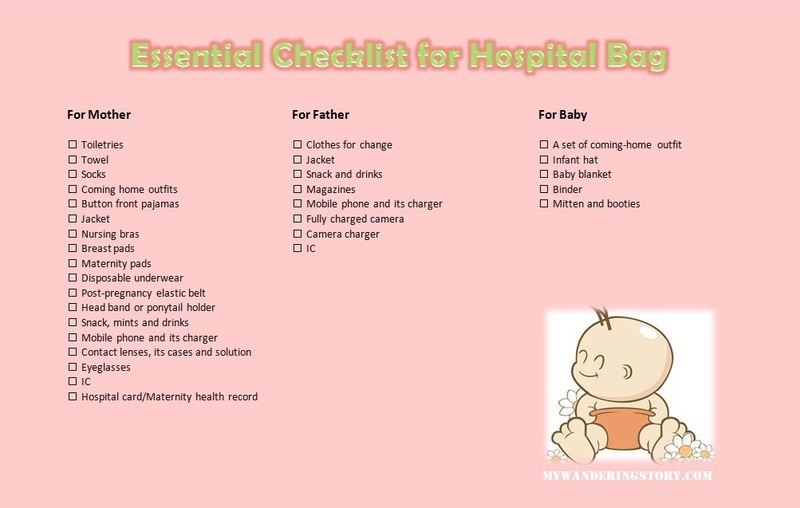 Guess what, when I checked the inside of my shopping bag from Bebe at home, I found this Essential Checklist for Newborn which I think quite useful. 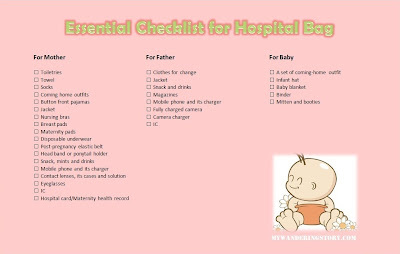 Click on the picture to get a better view of this checklist. In conclusion, I must say that the mother and baby exhibition last week was fairly well organized and most of the participating exhibitors were local and international prominent maternity and baby care items manufacturers. In addition, they gave away quite many of goodie bags and freebies. Who doesn't love the latter part? Although my husband and I didn't manage to buy some baby items as intended, I personally quite enjoyed checking out baby expo such as this one. I mean, as a new Mom-to-be, I am always excited and interested in shopping quality baby stuff at best rate. My mistake before going to baby expo like the one we went last week was not doing any legwork in finding out the usual/normal price of the baby and maternity stuff that my husband and I wanted to buy so we both could actually compare the prices with those sold during the expo. Also, I learned my lesson in becoming a more efficient pregnant shopper in an expo. My advice to pregnant mothers out there when shopping in an expo is to buy the product you like when you see something nice at a particular stand/exhibitor in the expo and find that the price of that product reasonable. Don't think of comparing prices, colours, designs, bargains, etc. at other stands in other sections because the exhibition centre used for an expo is usually huge and overcrowded with other buyers. By the time, you finish circling the whole exhibition centre and think of going back to the stand which sells stuff that interested you, you'd be too exhausted and lazy to walk all the way back to that specific stand just to get your stuff. Further, it is likely that you may forget the exact location of the exhibitor's stand you saw earlier on. Bear in mind that you are pregnant (and you have weaker legs and back) plus your hands might be full of some heavy shopping bags too by then. Yet, if you'd like to compare some products which are sold from stands/exhibitors whose locations are close to each other, by all means, check the other stands first before buying the items you want, especially for the pricey ones. So, am I still interested in attending baby expos again in the future? Yes, absolutely – but probably for my second baby! When life gives you lemons... Turn them into cookies or cake, then eat them! I found lots of fascinating lemon cookies recipes from the internet but finally decided to go ahead with the recipe from here that I have altered here and there. Here's my version of lemon cookies recipe I used yesterday. To make the cookies: Cream together butter and icing sugar by using high-speed electric mixer. Add vanilla, egg, fresh lemon juice and lemon zest into the mixture. Continue beating by using mixer until everything is well combined. Turn the doughs into mini balls and place them in a baking pan already lined with parchment paper. Gently press each ball with a fork to flatten the cookie. Bake the cookies in a preheated oven (160 degree Celsius) for about 20-25 minutes until the cookies' edges turn golden brown. Let the cookies cool completely before decorating them with the icing. To make the icing: Beat together icing sugar, vanilla essence and lemon juice by using electric mixer. Just use enough lemon juice to make a thick paste or stop adding lemon juice when you start seeing patterns when beating the icing. Put the icing in a piping bag and drizzle it over the cookies. Wait until the icing totally hardens before storing the decorated cookies in a tight plastic container. Perfect companions of a cup of hot tea. These lemon cookies are indeed delicious and refreshing. They are buttery and citrusy at the same time. If you wish to make flatter and chewy cookies/crisps, you'd need to reduce the amount of flour used for the cookie dough.